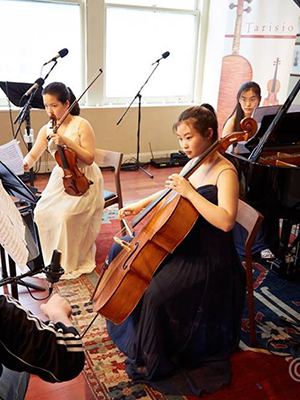 The Clef Trio consists of cellist Esther Yu, pianist Youlan Ji, and violinist Qing Yu Chen. They will perform on Show 324 in New York, NY, on May 24, 2016. Clef Trio is made up of three young artists enrolled in The Juilliard School’s Pre-College Division. 16-year-old cellist Esther Yu studies with Minhye Kim and was featured on From the Top in Show 316 in Rochester, New York. 16-year-old Youlan Ji studies with Yoheved Kaplinsky and appeared in Show 309 recorded in Vail, Colorado. 16-year-old violinist Qing Yu Chen studies with Masao Kawasaki, and has appeared on From the Top twice already: Show 280 in Wingate, North Carolina, and Show 294 in Aspen, Colorado.